Fuel gel is a fuel used for heating food, typically placed under a chafing dish. 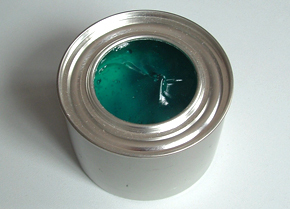 It is usually sold in a small canister and burned directly within that canister, with or without a wick. The fuel often contains methanol, ethanol, or diethylene glycol, as these may be burned safely indoors, and produce minimal soot or odour. These fuels are also used for emergency heating, outdoor cooking, and fondue.